To avoid any resolution loss and preserve fine spatial details, most of you are fond of enjoy your video files in the form of 4K. Nevertheless, the prevalent 4K videos will take up more storage space on your computer, causing severe crash and lag, especially when you play it online. To make it play smoothly without slowing down the loading speed, you are suggested to crop useless sections to shorten the original 4K video file in smaller size. If you happen to be looking for a dependable 4K video cutter, you cannot miss such a wonderful opportunity to know Joyoshare Media Cutter. It is one of the most effective splitting tools, aiming to keep your 4K video files acceptable. In order to give you substantial help, we are going to show you how to manipulate it in only 3 steps. 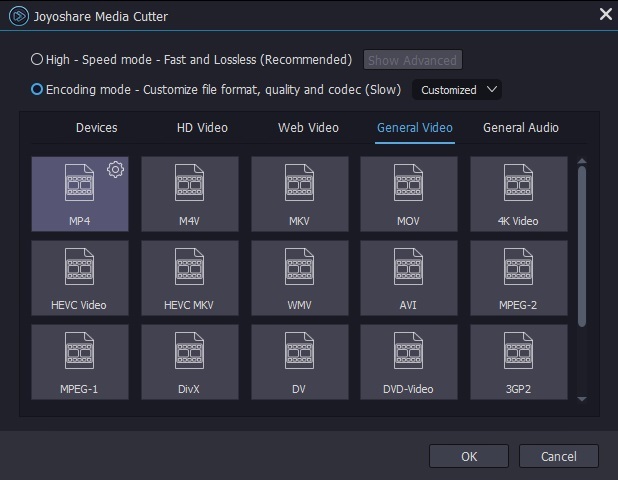 When asked which splitting tool is proper to cut 4K videos, Joyoshare Media Cutter can be put on the top priority as it is proved to be one of the most trustworthy video trimmers for both new starters and experienced professionals. This forthright cutting program comes with a series of thoughtful designs, with which you can shorten your large 4K video files and cut off unwanted parts. Alternatively, its comprehensive solutions allows you to convert the original video to other common format as well as portable device, such as MP4, M4V, MKV, MOV, HEVC, WMV, AVI, OGV, iPhone, iPad, Android phones, game console, etc. Aside from 4K video, it's also supportable to process any other video and audio files in efficient way. Be aware that only one 4K video files can be imported at a time. That is to say, it has no access to batch mode. Furthermore, you will get a big surprise to witness the whole cutting task completed at up to 60X faster speed. If you are in need of merging different segments into a new one, Joyoshare 4K Video Cutter can come in handy as well. Make sure that you have installed Joyoshare Media Cutter ahead of time so that you can get accustomed to its icon design, button layout, operation interface, cutting options in advance. Before you refer to the following detailed instruction, you can roughly know the whole procedures by utilizing it by yourself. 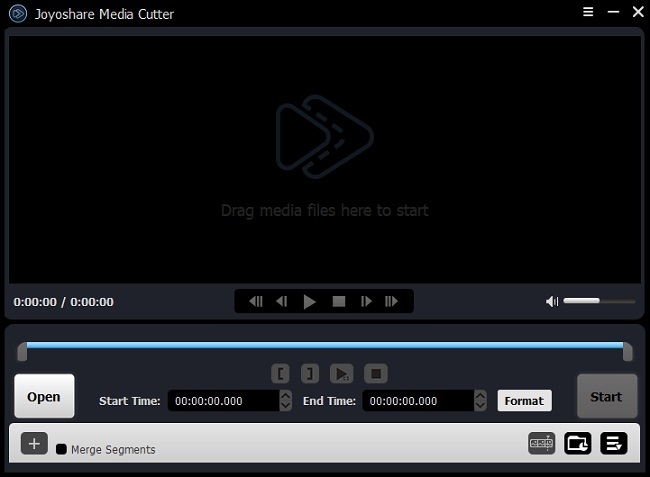 Once you launch Joyoshare Media Cutter, you can turn to get your 4K video file ready. You can hit the "Open" button to import the required 4K video to your program. Or quickly add it by dragging and dropping an open file. Note: Only one 4K video file can be imported into Joyoshare Media Cutter each time. As long as you add your 4K video into the main interface, Joyoshare Media Cutter will automatically play it for you. Now, it's your time to see which part is not pleasing. You can cut off both header and tail. If there is blank content, remove it as well. In order to enhance the preciseness, you have to take the aid of the control key, moving the beginning and end handles to isolate your satisfying sections. Other practical method is to enter specific start time and end time to set up the temporal interval. Note: Having stripped all unwanted clips from the original 4K video file, one critical step is to merge the rest existing scattered segments into one new file. There is no need for you to repeat above operation. Simple click the "+" button located at the bottom left corner and choose the option of "Merge Segments". 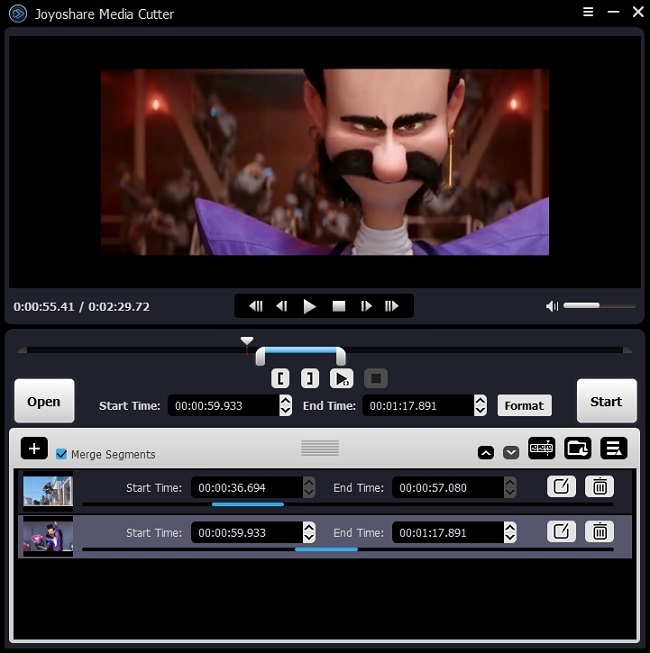 Joyoshare Media Cutter will produce more clips for you and combine it into one when you begin to cut. Press the "Format" panel to bring up a pop-up window. According to your preference, you can select any format you like, such as popular devices, HD video, web video, general video, etc. Providing that you want to extract audio from your 4K video file, you can direct to choose one accessible audio format from "General Audio". By doing that, you can get a compact audio file. What's more, you are empowered to customize the size, codec, quality, etc, in your way. Apparently, different mode can make different effects accordingly. After you make full preparation, you can go straight to hit the "Start" button. 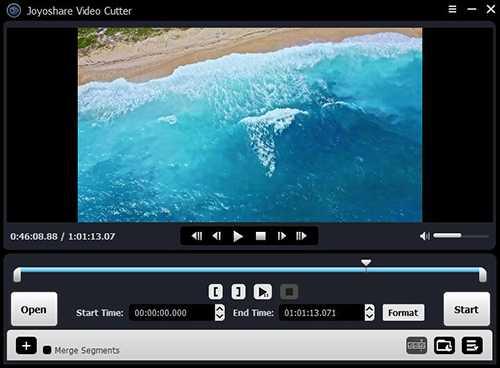 With only few clicks, Joyoshare 4K Video Cutter will fulfill the assignment. Hence, you can go for checking destination folder and delete discontent videos.